In part two of our interview, Stéphane Israël looks ahead and discusses Arianespace's strategic outlook for the rest of the decade. He also responds to recent announcements and advancements made by Arianespace's two main competitors -- International Launch Services and SpaceX. Question: ILS is trying to do dual-satellite launches in a stacked load-bearing configuration with a minimal adapter in between. I'm curious if you could launch without a Sylda adapter? Israël: The Sylda gives you much more flexibility to make a dual launch. In fact, ILS has been trying for years to make dual launches, and they've never been able to convince any commercial customer for a stack. Maybe they will. I don't know. There is a lack of flexibility because you need two satellites to be exactly ready at the same time, and so on. The Sylda gives us much more flexibility. For us, it's not the same to go for a dual launch with the Sylda and with a stack. The best demonstration for that is this is not new for ILS. ILS has been trying for years to sell a stack and never been in a position to convince customers to go for this option. We know they are trying to do so. We think this solution would not be preferred by the customer because it lacks flexibility. Question: I have heard some people talk about triplet launches on Ariane 5 ME. Wouldn't that introduce even more challenges in matching payloads on the manifest? Israël: Basically, Ariane 5 ME is meant for dual launches and to have one bigger satellite in the lower position along with a large satellite in the upper position. But it is true that you could have two satellites in the upper position and one in the lower. The advantage of Ariane ME is that it will bring more flexibility for the dual launch because it can lift up to 11.5 tonnes [to GTO] after de-orbiting, meaning you can have a 6-tonne satellite in the upper position, and up to 5.5 tonnes in the lower position as opposed to 3.5 tonnes today. It gives you the ability to embrace all the market possibilities, plus you have the re-ignitable upper stage. Those are two good arguments for Ariane 5 ME. The third one is to have a bigger volume under the fairing. If you take more volume under the fairing, plus more capacity for mass at the same price, and the re-ignitable upper stage, we think this is a good case for Ariane 5 ME. We need to work on the overall cost of the system. That is something we are working on now. The rockets we just bought from Airbus are 5 percent cheaper than they used to be, with more flexibility on the contract, so we are working on the cost of the system. In terms of quality competitiveness, there is no doubt that Ariane 5 ME has some added value for us. 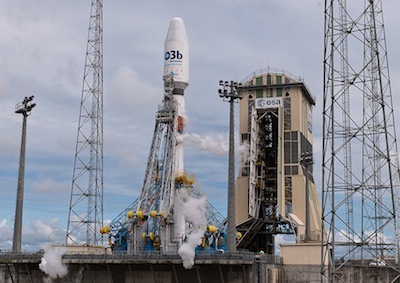 Question: The option for launching three satellites to GTO on Ariane 5 ME -- is that just something people are talking about or are you analyzing that? Israël: You could have one satellite, for instance, in the lower position and two in the upper position, and there it would be stacked. I do not say it is a nominal scenario, but why not? If stacks begin to be convincing for the customers, in a scenario where we have a decrease in the mass of the satellite due to electric propulsion, we could go for a triple launch. Why not? It is possible. Question: When do you expect to finalize the next order for Soyuz launchers from Russia? Israël: The discussions are very well advanced, and by summer at the latest, the next batch will be done. We are very confident now. We have had, in the last six months, very positive discussions with Roscosmos, so we are now not far from an agreement. Question: Will the cost change much from the previous order? Israël: The price will not be very different from the previous order. We have been able to go for the price each partner wanted. We are now not far from a good agreement for both of us. Question: How many will you order? Israël: I cannot disclose that now, but you will know quite soon. Question: How long will this next batch of Soyuz last? 2018, 2019? Israël: With this batch, we should be able to go up until the end of the decade. Question: What is the future for Soyuz after Ariane 6 is operational? Israël: Our partnership with Roscosmos is definitely a long-term partnership. In Europe, we have made a huge investment to have Soyuz in Kourou, so we are quite sure there will be Soyuz in the next decade. There is no doubt on that. Regarding Ariane 6, there are some comments which have been made that since Ariane 6 is 6.5 tonnes [to GTO] with no modularities, it's overpowered for Soyuz satellites, which means that you can have both rockets in parallel in the long term. Question: Do you have Soyuz on the manifest now for GTO launches? Question: How do you respond to SpaceX's recent successful launches to GTO? Is it making you reconsider launch prices, offer more services, or become more flexible to customers? Israël: I think it's increasing the competition. SpaceX is here now, but there could be some other comers. The customer must compare us, and we have a track record that none of our competitors have. We have launched 216 Arianes. We have made 58 successful launches in a row. We have the quality competitiveness of our systems. Now with Ariane 5 ECA, and we are adding more volume under the fairing. I have decided in favor of a new building to have the capability to cope with more satellites. After that we have Ariane 5 ME and Ariane 6. That is our roadmap and it is a convincing one. We are also working our cost. We have one single goal. It is to have all our customers' satellites in GTO. We do not target to go to other planets. This is not our target. The reason we are here for more than 30 years is this reason: When our customer comes to us, they know Arianespace has one single goal, and that is to make sure their satellites are in orbit. Other competitors may have different goals. It is their choice. We are welcoming competition. We will react. We do not want to be arrogant. It is absolutely not our mindset. Competition is always a challenge, but we are ready to face it. Question: Were you surprised SpaceX was able to tick off three launches in just a few months? Israël: I think the competitor you mention has a lot of work to do for NASA, and I think what is most important to them is the institutional American market. I think it was important to have the launches made as quickly as possible to be in a position to compete on the military American market. I'm not totally surprised because I think it is very much linked to the willingness to compete on the market where they really make money. It's a matter of fact that when they go to the institutional market, their prices are increasing by at least 27 percent to 72 percent according to their website, so that's a lot more over commercial launches. It seems that now they are in a position to compete very strongly with ULA, but what I can say regarding Arianespace is we have been launching satellites for private American operators. We have some cooperation through CNES and NASA for institutional payloads. We would be ready to compete on the institutional American market. We are ready if there was a possibility to do so. We are quite sure we can come with the best solution for institutional customers, for American taxpayers, and even for jobs because if the market was to open, we would be ready to have some American content on the rocket if ESA allows us to do so. My message is we welcome competition, and we would even be ready to compete on this American institutional market. Question: Are you happy with Ariane 6? Israël: Ariane ME and Ariane 6 are going full speed ahead with very good results and a strong commitment from industry on Ariane 6. 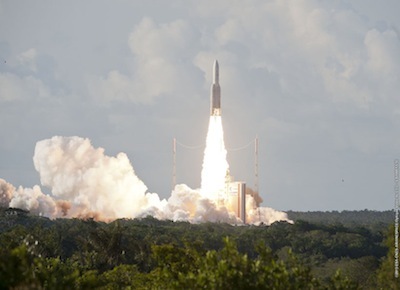 For Ariane 5 ME, there was a verification key point in December for ESA. Arianespace is interested in both projects. Both make sense. Ariane 5 ME increases the overall flexibility and Ariane 6 is a a good cost-reduction project. We favor both projects. We hope Europe will be able to confirm both of them at the end of the year. It is really what we wish. What we see is that both projects are making very good progress, and we are very happy with that. It shows, with this evolution of the competitive landscape, that Europe is determined to remain a key player in the next decade.